FSM-managed machines come pre-installed with an application that allows us to push necessary updates to FSM-managed computers and allows you to install certain programs offered by Feinberg IT. 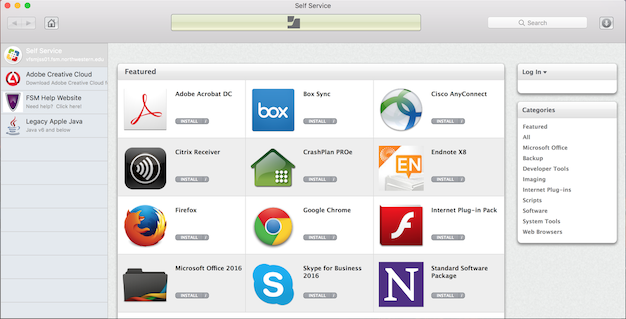 On Mac computers, the application is Self-Service. On Windows computers, the application is IBM BigFix. The Northwestern Standard Software Package, which includes the Microsoft Office suite, Skype for Business, Symantec Endpoint Protection, Mozilla Firefox, Google Chrome, Cisco AnyConnect VPN Client, Adobe Flash plug-in, Adobe Acrobat, CrashPlan PROe, and Java plug-in, is also offered through this service. To download an application/software package, simply click on the Install button located under each of the offerings. You can also click on the i next to the Install button for more information on the application/software package. To see which applications/software packages are available for installation on your computer, click on the Offers tab. To download an application/software package, click on the application/software package you want to install and click on Accept.